This weighted average cost of capital calculator, or WACC calculator for short, lets you find out how profitable your company needs to be in order to generate value. With the use of the WACC formula, calculating the cost of capital will be nothing but a piece of cake. 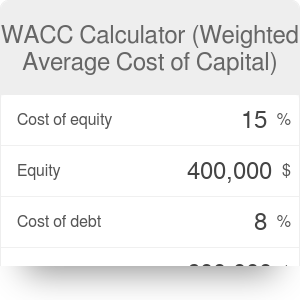 If you already know how to calculate WACC, make sure to take a look at its real-life application in the discounted cash flow valuation. If you are an entrepreneur, one of your primary objectives is increasing the value of your company. In order to do that, you often need a lot of starting capital to make necessary purchases or to get your business off the ground. There are many potential sources of capital: common and preferred stocks, but also bonds, or even debts. They are generally divided into two categories: equity, which is the total value of all assets, and debt, which is the money you borrowed. The capital gained through equity or debts comes at a certain cost. The cost of debt is pretty straightforward - you always have to give back more money that you borrowed. The proportion between borrowed and returned capital is expressed with an interest rate. For example, if the interest rate is 8%, you have to return $108 for every $100 you acquired. In case of the cost of equity, the calculations are not so straightforward. Generally, it is assumed that the cost of equity is all the expenses you need to bear in order to convince your stakeholders that your company is worth investing in. If your stakeholders don't feel that the risk they are taking is being compensated, they will likely sell their shares, which will result in a decrease in the value of your company. If your company is financed from both equity and debt, then you need to combine the cost of debt and cost of equity in one metric to find out whether it will be profitable enough. This metric is called WACC - the weighted average cost of capital. If the rate of return of your company is higher than the WACC, it is profitable. If the rate of return is lower, your financing costs are not covered, which usually means you're in deep trouble. T is the corporate tax rate. The corporate tax rate takes into account the tax deduction on interest paid. If you're still unsure whether you understand the concept of the weighted average cost of capital, take a look at the example below. It explains how to calculate WACC for a small company in detail. Determine how much of your capital comes from equity. For example, you might have $700,000 in assets. Write down your debts - for instance, you might have taken a loan of $500,000. Estimate the cost of equity. Let's assume it is equal to 15%. Check the cost of debt, too. For example, the interest rate on your loan might be equal to 8%. Decide on what is the corporate tax rate. We will assume it is 20%. This value of WACC can be used in further calculations as the cost of capital. For example, you can apply it in our Net Present Value calculator. WACC Calculator (Weighted Average Cost of Capital) can be embedded on your website to enrich the content you wrote and make it easier for your visitors to understand your message.